In an era when the president of the United States is an inveterate, habitual, daily liar, about all things great and small, and especially about himself, factchecking sites can provide an invaluable—if increasingly overwhelmed—public service. Though the siloing off of this core function of journalism still presents, I’d submit, something of a moral hazard—the implication being that the existence of a distinct factcheck team alleviates political beat reporters from the responsibility of meticulously calling out spin and falsehoods on a routine basis—there are resource benefits to having a dedicated team focused on separating fact from fiction. This does not mean, however, that factcheck journalism in the corporate press is free from the institutional pressures of “both sides” objectivity. Precisely because of President Trump’s unprecedented propensity to lie, there can be a latent urge among factcheckers to find similar examples of dishonesty among the left, to provide some semblance of “fairness.” And, at times, these efforts can devolve into obtuse, bad-faith examples of nitpicking and false equivalence. 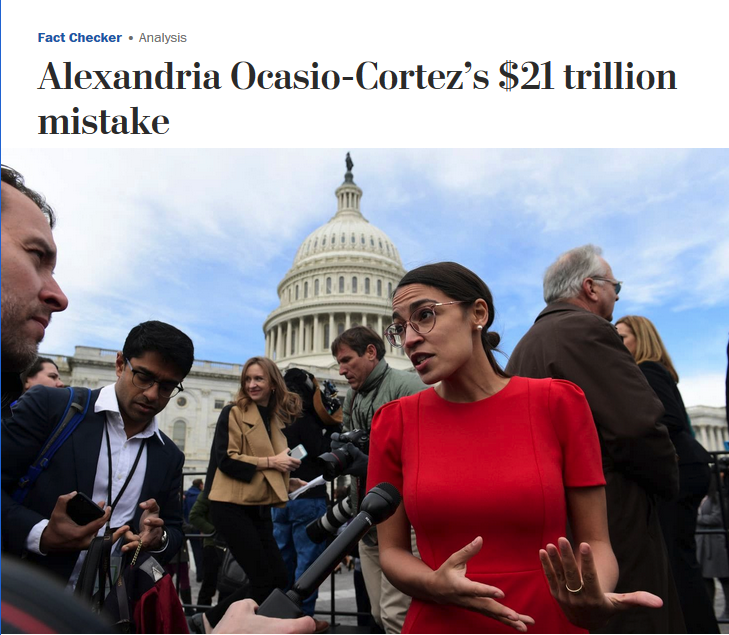 The Post’s factcheck headline (12/4/18) two days later was unquestioningly blunt: “Alexandria Ocasio-Cortez’s $21 Trillion Mistake.” So had Ocasio-Cortez simply made up the $21 trillion number? No. Invented the study? Unfairly singled out the Pentagon? Bungled the math, inaccurately dividing 21 into 36? No, no and no. A bit of important context: Ocasio-Cortez has drawn an extreme level of scrutiny from conservatives of late. Scouring her Twitter feed or informal video chats to single out any slip of the tongue is now a favorite past-time of her right-wing critics. (They do so at their own online peril.) With her massive social media presence and ability to influence online trends, the mainstream press has taken notice as well. In fact, this latest Post factcheck is the second time the paper has singled her out in the past six months. The first time was back in August (8/10/18), before she was even a member of Congress, and the pedantry was strong. Among its very literal factchecks, the paper judiciously rated it as “false” when Ocasio-Cortez said in an on-air interview about unemployment: “Everyone has two jobs.” Great catch, guys. And indeed, the plugs are found on both the positive and the negative sides of the ledger, thus potentially netting each other out. But the Pentagon’s bookkeeping is so obtuse, Skidmore and Fitts added, that it is impossible to trace the actual sources and destinations of the $21 trillion. But it did not appear in her tweet, which clearly implied that the $21 trillion could have been used to pay for 66 percent of the $32 trillion in estimated Medicare for All costs. 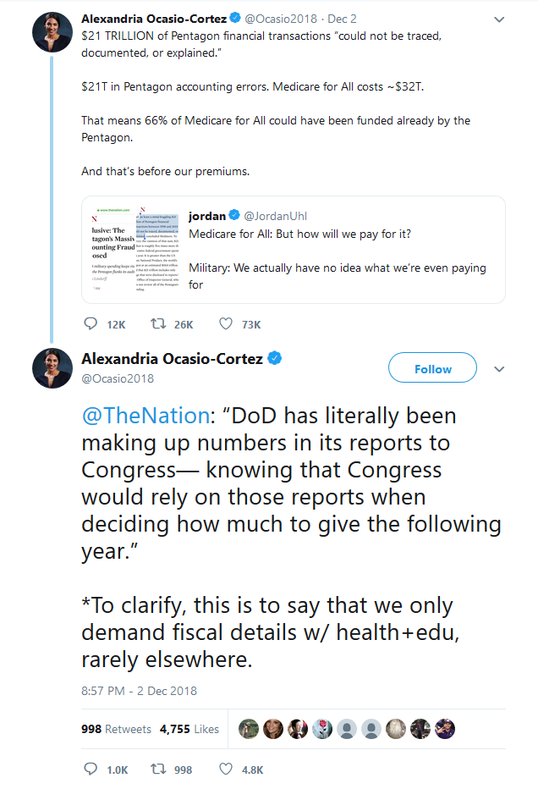 To recap, Ocasio-Cortez did not think to include an somewhat intricate, detailed disclaimer about the unaccounted for Defense spending—of which, again, no one knows how much was really lost—in her initial 280-character tweet (though she did reference the Nation article that explains those details). And her follow-up tweet, which sought to clarify and expand the point that she was talking about broad fiscal-policy priorities, did not lessen the damage in the Post’s eyes, because the initial tweet still stands. The Post’s factcheck further criticizes her claim by pointing out that the two amounts aren’t apples-to-apples comparisons anyway, since they cover different time periods. This is, simply put, pure pedantry; the federal government routinely reallocates monies from one project to another over varying, different timelines. To claim this as another kind of “gotcha” is just silly. But then, the Post Fact Checker already tipped its hand earlier this summer in its stubbornly pessimistic take on Medicare for All (8/7/18), which joined a broader math-challenged disdain for it among the mainstream press, as FAIR (7/31/18) has noted previously. But perhaps most noticeable about the Post factcheck of Ocasio-Cortez is its damning verdict. “Four Pinocchios” was warranted, the column concluded, because her “badly flawed” tweet is still up, “probably causing confusion.” Probably. And the Post even acknowledges that Ocasio-Cortez references in her tweet the actual article that gives the missing details and context. No matter. 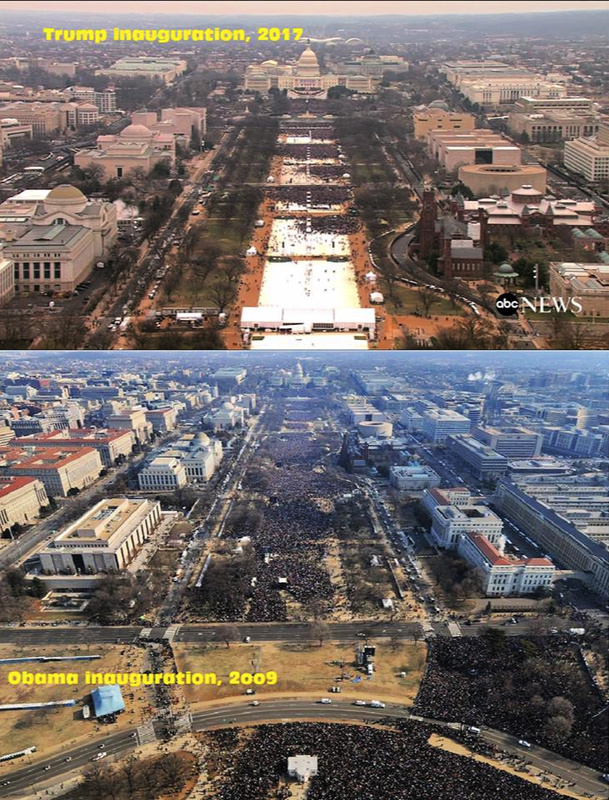 Trump’s latest claim in a long series of obviously, provably false boasts about the size of the crowds that attend his rallies (including, infamously, his 2017 inauguration) (11/19/18). Trump’s series of totally uncorroborated or demonstrably false statements viciously fear-mongering about the “migrant caravan” in Mexico, claiming with zero evidence that it was harboring criminals, MS-13 gang members, Middle Easterners and terrorists (10/25/18). Trump’s claim of $110 billion in US arms sales to Saudi Arabia during his administration, which a Brookings Institution military expert flatly called “fake news” (10/11/18). Note that this claim came more than a year after Trump returned from visiting the country and claimed the US had sold them $270 billion in arms, which the Post Fact Checker (6/8/17) only gave “Three Pinocchios” at the time. Huh? Trump’s summary dismissal of all the numerous scientific and academic estimates that thousands of Puerto Ricans died due to Hurricane Maria and its aftermath as a result of the administration’s woeful response (9/13/18). Trump’s repeating of completely untrue white supremacist propaganda that the South African government is seizing the land of white farmers (8/24/18). Trump’s completely made-up, oft-repeated claim that he has prompted six new steel plants to open in the US since becoming president (6/28/18). Trump’s xenophobic, totally backwards claim that crime is up in Germany due to immigration—it’s down—and his floating a fantastical conspiracy theory that the real numbers about immigrant crime were being covered up (6/20/18). Trump’s outrageously false claim just after his Inauguration that millions voted illegally in the 2016 election (1/24/17). So, according to the Washington Post Fact Checker’s journalistic calculus, all of these lies by President Trump—among many others I didn’t bother to list—are just as far removed from the truth as Ocasio-Cortez’s tweet. Make no mistake, this is an absurd false equivalence. Did she inaccurately enumerate Pentagon waste in a political argument? Certainly. Did she willfully, intentionally and repeatedly attempt to mislead the public, smear minorities, or traffic in racist propaganda or conspiracy theories, as in the above examples of Trump’s rhetoric? The question answers itself. But it is indicative of not-so-subtle double standard to watch for going forward, especially now that the Democrats will hold majority power in the House. If the sheer volume of lies and misinformation out of the two parties in Washington can no longer be reasonably equated thanks to the president’s pathological dishonesty, then the mainstream press’s “objectivity” model will look for opportunities to match individual grades of dishonesty. Never mind that they will have to torture their own standards of truth and good faith to do it.